One of my favourite things about Spring has to be the delicious seasonal produce. Right now, Asparagus is in season and it’s something I’m definitely happy about. All of the local farms where I live are filled with bundles of fresh Asparagus to buy and fields for picking your own. Making the most of this, I recently purchased an extravagant amount of the vegetable, ready to eat until my heart was content. Grilled, roasted, boiled or made into soup, Asparagus is definitely one of my favourite vegetables by far. I’ve always loved making it into soup as it’s really quick to prepare, and makes a meal thats satisfying and full of flavour. 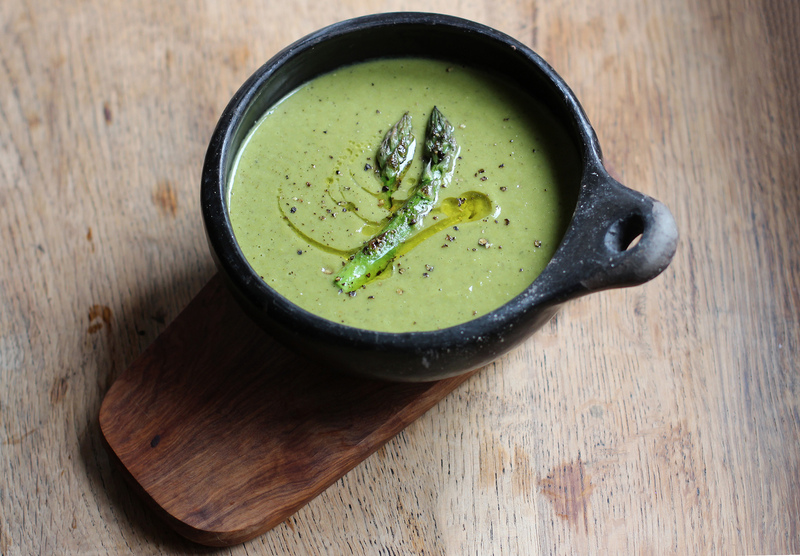 When I make my Asparagus soup, I love to pair it with Peas. They manage to add a subtle, mellow sweetness to the dish, and help create a bowl of something I could easily eat several helpings of. I keep the flavourings simple with some vegetable stock, mixed herbs and a generous helping of ground black pepper to finish. Mmm! 1. Firstly, chop your asparagus into fifths and finely slice your onions. Then, add them into a large pan on a medium-high heat with the 2 tbsp olive oil. Fry for 4-5 minutes, stirring to avoid burning. Then, slice your garlic cloves and chop your celery, and add them into the pan to fry for another 2-3 minutes. 2. When the onions are golden/translucent, add in the peas, water, vegetable stock, mixed herbs and salt and pepper. Reduce to a medium heat, and allow to bubble and cook for about 10 minutes. When this is done, remove from the heat (cooling if necessary), and blend before serving – add any extra seasoning if necessary, to suit you. 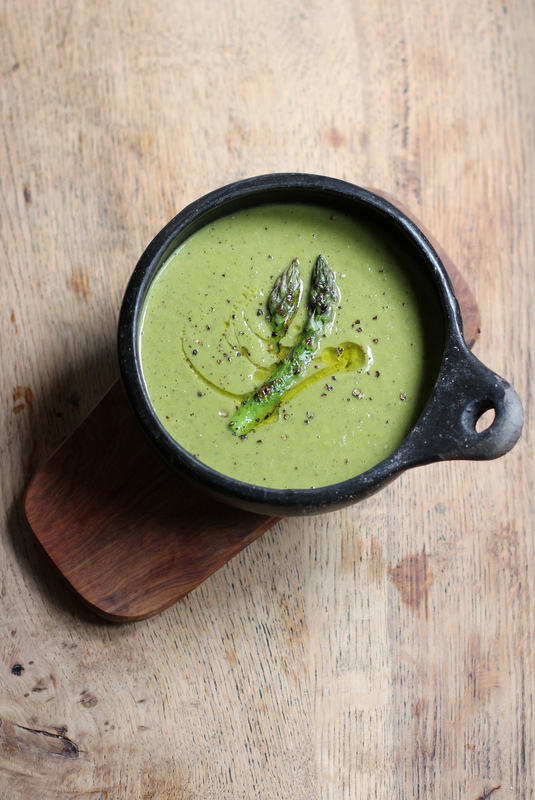 To decorate, you can top the soup with some grilled asparagus, a drizzle of extra virgin olive oil and some pepper to finish. Mmmm bring on the Spring green soup comfort! 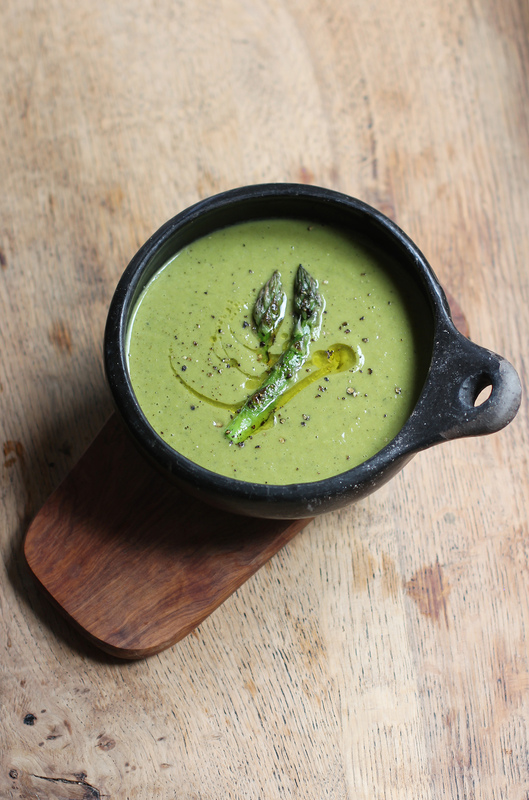 How good does this asparagus and pea soup look! I just love seasonally inspired soups like this right now and definitely need to make the recipe. Just divine. This sounds incredible, and so simple! Gorgeous photos; thanks for sharing! Two of my favorite things in one pretty green soup. This sounds amazing! What a stunning soup! We have so much asparagus growing around our property — I always love finding new ways to use it up. This soup is so unbelievably beautiful I just know I have to make it! So you can prepare this soup in less than half an hour? I’m sold! !